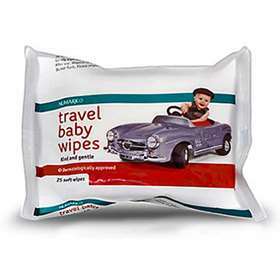 Numark Travel Baby Wipes are specially formulated to clean a baby's delicate skin. They are all soft, strong, kind, gentle and freshly fragranced, making them the ideal product to use when travelling. Peel back the adhesive label, remove wipe and ensure the pack is properly re-sealed to prevent wipes from drying out. Gently wipe over baby's skin as required. After use, dispose of wipes in a bin. Do not flush. Please respect the environment. Aqua, Propylene Glycol, Polysorbate-20, Phenoxyethanol, Capryl, Capramidopropyl betaine, Disodium EDTA, Parfum, Dehydroacetic Acid, Benzoic Acid, Sorbic Acid, Sodium Citrate.